Meet Ray Black, Jr... Born in Montgomery, Ala., Ray Black, Jr. moved to Palm Coast, Fla., when he was just nine years old and quickly developed an affinity for the water. Spending time with his father learning about deep sea diving, Ray also developed an interest in motorsports through video games when he was a teenager. Convincing his father to let him race, Ray began his career participating in the Florida Mini Cup Racing Association and later graduated to late models. After finishing high school, Ray took a two-year break from the sport to become more versed in the family business-CDA Technical Institute-a commercial diving academy. Already licensed as a deep-sea diver, Ray also became a supervisor in the commercial diving division. Despite shifting his career-focus to professional motorsports, Ray continues diving as a hobby. Round One-Ray Black Jr. Battling for the Rookie Of The Year Title... Ray Black, Jr., will make his Daytona (Fla.) International Speedway debut this Friday night in the NextEra Energy Resources 250. After competing in seven NASCAR Camping World Truck Series (NCWTS) events for SS Green Light Racing last year, Ray will join the team for the full 23-race schedule this season and will also race for the Sunoco Rookie of the Year title. Racing at Home... A 2009 graduate of Matanzas High School in Palm Coast, Fla., Ray Black, Jr. considers Daytona International Speedway his home track. The NCWTS Rookie contender currently resides just 25 miles from the speedway in Flagler Beach, Fla. Racing with Support from ScubaLife... Ray Black, Jr. will partner with Jacksonville-based ScubaLife for his 2015 NCWTS campaign. ScubaLife is a social network dedicated to promoting diving as a way of life. The network strives to appeal to people on an emotional level to attract new divers into the diving lifestyle. Connecting like-minded people, ScubaLife provides the best possible resource partnerships for divers, including education, equipment and experience. Party at Miller's Ale House... Fans are invited to join Ray Black, Jr. and the ScubaLife team at Miller's Ale House (2610 West International Speedway Blvd., Daytona Beach, FL) on Thursday night from 5:30 p.m. to 6:30 p.m., and again on Friday night following the NCWTS race for a party at the Ale House! Meet NASCAR driver Ray Black, get an up-close look at his No. 07 ScubaLife Chevrolet Silverado and race transporter and eat great food during this fun event. With Miller's Ale House located just down the street from Daytona International Speedway, be sure to stop. Meet Ray Black, Jr... Ray Black Jr. will make several public appearances throughout the race weekend, giving fans plenty of opportunities to meet the driver of the No. 07 ScubaLife Chevrolet Silverado. On Friday morning from 11 a.m. until 1 p.m., Ray will join a group of current and retired NASCAR drivers at the Daytona Beach Kmart (1300 W. International Speedway Blvd, Daytona Beach, FL), for an autograph session. Later that afternoon, Ray will join the other stars of the NASCAR Camping World Truck Series for a one-hour series autograph session in the Sprint FanZone, beginning at 2:30 p.m. Additionally, Ray will make an appearance at the Chevy Stage in the Fan Midway at 2:00 p.m. ET. NCWTS On the Air... The NASCAR Camping World Truck Series will race at Daytona International Speedway on Friday, February 20. The NextEra Energy Resources 250 will be broadcast live on FOX Sports 1, MRN Radio, and SiriusXM NASCAR Radio, beginning with live pre-race coverage at 7:30 p.m. EST. Follow Ray Black, Jr... Fans are invited to connect with Ray Black, Jr., driver of the No. 07 ScubaLifeChevrolet Silverado on Facebook (@Team Scuba Racing) Twitter (@TeamScubaRacing), and Instagram (@RayBlackJr07). Fans can also visit TeamScuba.com for additional news and updates. Ray Black, Jr. 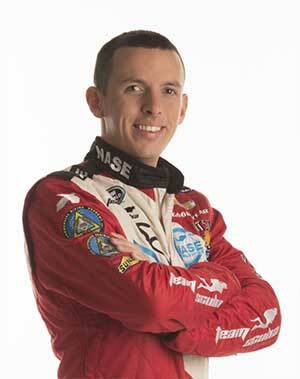 Quotes... On racing at Daytona: "Racing at Daytona International Speedway is a dream come true for me. Honestly, I think racing at Daytona is a goal for any racecar driver, but to be racing the No. 07 ScubaLife Chevrolet this close to home, with so many family members and friends at the track, is a really big deal. Diving has always been a passion of mine; my family is heavily involved in the diving industry, and our partners are active in that industry, too. To be able to have the diving industry help get me to the track, while also using the racing to help elevate the diving industry-it's a really cool dynamic, and one that I'm excited to be a part of." Ray Black, Jr. and the No. 07 ScubaLife Chevrolet Silverado team will compete with chassis No. 1117 on Friday night. The SS Green Light Racing team has two top-10 finishes with this chassis, including a ninth-place finish last spring at Daytona International Speedway.